"Trevanian" is a pen name of Dr. Rodney William Whitaker, born June 12, 1931 in Granville, New York. He died December 14, 2005 in the English West Country. Although some believe the pseudonym he chose was based on the name of English historian G.M. Trevelyan, he told friends that he used the name of an Armenian acquaintance of his. Whitaker also published works as Nicholas Seare and Beñat Le Cagot as well as under his own name (The Language of Film). His detective novel The Main was originally slated to appear under the pen name Jean-Paul Morin. 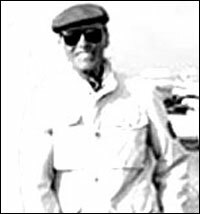 After serving in the U.S. Navy from 1949 to 1953 during the Korean War , Whitaker completed his B.A. (1959) and M.A. (1960) in Drama at the University of Washington and went on to obtain a Ph.D. (1966) in Communications from Northwestern University in Evanston, Illinois. Whitaker also taught drama at Dana College in Blair, Nebraska before becoming an associate professor at the University of Texas at Austin's Department of Film in the late 1960's where he eventually became department chair. Rod Whitaker is also listed as a director on the 1970 film Genesis III, a collection of experimental student short films. Whitaker along with Richard Kooris also wrote and filmed Stasis, a one-hour movie which was loosely based on Jean Paul Sartre's short story The Wall. Stasis won Esquire Magazine's Publisher's Award in 1970. Whitaker was also a Fulbright scholar in England during his time at the University of Texas. Since the late 1970's Whitaker had resided with his wife of forty years in the Basque region of France, the setting of his novels Shibumi and The Summer of Katya. Whitaker wrote many bestselling novels, one of which, The Eiger Sanction, was made into a 1975 movie starring Clint Eastwood. Trevanian described the movie as "vapid" in a footnote in Shibumi. He requested (and received) a screenwriting credit as Rod Whitaker. The balance of the script was written by Warren Murphy, the mystery author perhaps best known for co-writing the Destroyer series of men's action novels, about a similarly sarcastic assassin. Trevanian kept his true identity unknown for many years, and refused to grant interviews or contribute to the publicity efforts of his publishers. Trevanian's first known interview was granted to Carol Lawson of The New York Times for a June 10, 1979 article coinciding with the release of Shibumi. In this article Trevanian stated that "Trevanian is going out of business. Now he can talk." It was often rumored that he was actually Robert Ludlum using a pen name to which Trevanian stated, "I don't even know who he is. I read Proust, but not much else written in the 20th century.". It is possible that the myth arose out of confusion caused by the fact that Ludlum himself once wrote a novel called "Trevayne" in which he departed from his usual style, as well as his customary title convention of the definite article followed by a name and a noun (usually an abstract noun). The most comprehensive source of information remains a written response to a series of questions in an August 10, 1998 online interview for Publishers Weekly, while promoting his comeback novel, Incident At Twenty-Mile.